Wholesaler & Trader of Mens Kurta Pyjama. Our product range also comprises of Men Kurta Pajama, Party Wear Men Kurtas, Men Pyjama and Designer Embroidered Kurta Payjama, Kurta Pyjamas. Chaahat is always involved in offering a wide array of Kurta Pyjamas. The presented range of Mens Kurta Pyjamas is stitched & designed by using top branded fabric and latest machinery in compliance with set industrial standards. Our beautifully stitched Mens Kurta Pyjamas is obtainable in various sizes with a stylish look. What’s more, our product Mens Kurta Pyjamas adds the elegant appearance to the wearer & also our clients can buy these Mens Kurta Pyjamas from us at reasonable rates. Our patrons can purchase from us a wide and stunning range of Royal Mens Kurta Pyjamas. Our scrupulous Mens Kurta Pyjamas attributes attractive color combinations with elegant patterns. The presented range of Mens Kurta Pyjamas is highly soft, skin friendly and long lasting with stunning designs. Our presented range of Mens Kurta Pyjamas is designed from top branded fabrics designed by experienced professionals. 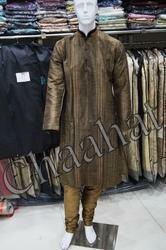 Our clients can purchase the presented Mens Kurta Pyjamas at reasonable rates. Our well-trained designers & workers support us in offering a wide collection of Gents Kurta Pyjama in our country markets. The presented selection of Mens Kurta Pyjamas is stitched & designed by our experienced tailors & designers having years of experiences in their work. 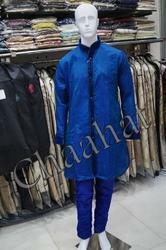 This Mens Kurta Pyjamas is admired for its amazing quality, color combination. 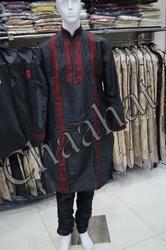 Our presented Mens Kurta Pyjamas can be stitched as per the requirements of our clients. 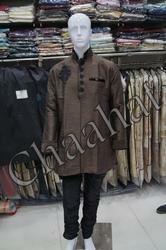 Chaahat have come up Brown Mens Kurta Pyjamas, which is designed as per the latest market trend. These Mens Kurta Pyjamas are fabricated using high-grade silk, which provides softness. Our Mens Kurta Pyjamas are offered in various sizes, designs and color combinations, which meet the client's demands. Our Mens Kurta Pyjamas are available in various sizes, designs, and patterns. We have come up with Men Fancy Kurta Pyjamas, which is designed as per the latest market trend. These Mens Kurta Pyjamas are fabricated using high grade cotton, which provides softness. Our Mens Kurta Pyjamas are offered in various sizes, designs and color combinations, which meet the clients demands. Our Mens Kurta Pyjamas are available in various sizes, designs and patterns. Clients can avail a wide range of Blue Mens Kurta Pyjamas from us that is designed and made by skilled designers and professionals. Made using top quality fabric, these Mens Kurta Pyjamas are appreciated by the clients. Designed in compliance with the global fashion trends and quality standards, these Mens Kurta Pyjamas are widely popular among the customers. 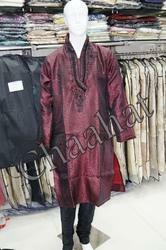 After collecting vast range, Chaahat are engaged in offering an elite range of Maroon Kurta Pyjamas. Our creative designers of Mens Kurta Pyjamas keep on following the ongoing trends, while designing this Mens Kurta Pyjamas. This Mens Kurta Pyjamas is made obtainable with beautiful additions and computerized embroidery to meet the needs of clients. 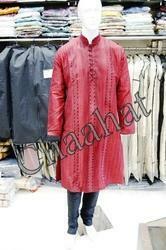 Our patrons of Mens Kurta Pyjamas can purchase this at reasonable prices. 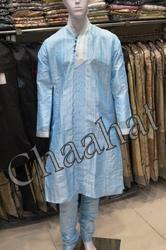 Chaahat is a leading manufacturer and supplier of stylist's hand Traditional Mens Kurta Pyjamas. The offered range of Mens Kurta Pyjamas is carefully designed, keeping in mind the contemporary trend and the numerous preferences of our high end customers. We use superior quality fabrics Mens Kurta Pyjamas in the manufacturing of offered Mens Kurta Pyjamas ensures softness, colorfastness and high comfort. Our quality of Men's Kurta Pyjamas inspector stringently checked the product before dispatching it to the clients. Moreover, clients can avail the offered product Mens Kurta Pyjamas from us at market leading prices. 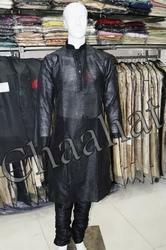 Black Mens Kurta Pyjamas offered by us is designed for all age groups, and are made available in various sizes. Availability in attractive colours, patterns and shades makes our Mens Kurta Pyjamas hugely popular amongst customers. These Mens Kurta Pyjamas garments for men are designed as per the latest fashion trends. Further, client's specific preferences and demands are given due importance while designing our Mens Kurta Pyjamas. 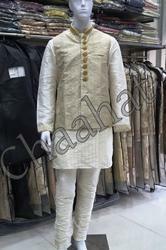 Chaahat offering Plain White Kurta Pajama for men Ravishing attire like this, speaks the story of style. This Kurta pajama has a soft cotton belt for convenient fitting on the waist. It has White Color pajama.